Comes complete with all brass standard size spigot , extension hose ,powder coated steel screen and child locking screws .No base required . Enviro World Corp. warrants its products to be free from defects in materials and workmanship under normal use and service for a one year period. 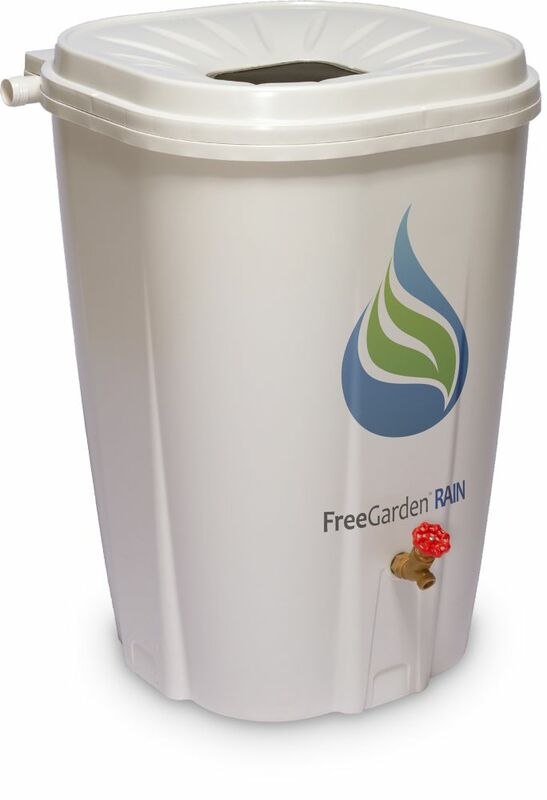 The FreeGarden" RAIN 55 Green gallon rain barrel is designed with the homeowner/gardener in mind; affordable, attractive, easy to move, easy to install, and easy to use. With as many as three bins easily fitting in the back seat of a regular sedan, the average buyer doesn't need to arrange special transport. The barrel's square shape is ideal for attractive flush to wall and corner installations. The tall spigot placement accommodates most watering cans, and four additional spigot mount points are provided lower on the barrel. Manufactured with a maximum of recycled content (varying by colour option), the FreeGarden" RAIN contains enough virgin resin to ensure optimal product durability and lifespan. 55 Gal. Rain Barrel The Free Garden rain collection system is designed specifically with you the home owner in mind .Its sleek never aging look fits naturally into any location around the home .The flat back and square design allows it to fit flush to wall or corner installation .Injection moulded and made from high density polyethylene makes it easy to keep clean and looking brand new year after year .It comes complete with a powder coated steel screen ,all brass standard size spigot, extension hose and child lock screws .The spigot is located to allow for easy access with any watering can eliminating any need for a base .The two sided overflow allows for multiple connecting containers from either side . Your garden and lawn will love your preserved precious warm natural rain water. 55 Gal. Rain Barrel is rated 4.4 out of 5 by 417. Rated 5 out of 5 by Okrosebud from Easy to assemble. Hasn’t rained since I got them, but... Easy to assemble. Hasn’t rained since I got them, but impressed with the way they are made. Wanted one that would open from the top so I can use submersible pump to water and would be easy to clean. Rated 1 out of 5 by Carolyn from Bad buy The bottom of this cracked after one season and it is no longer usable. Rated 5 out of 5 by Transference from Great rain water collection system. Highly recommended. Great rain water collection system. Highly recommended. Can you open the entire top to empty and clean at the end of the season?